By the time this reaches you, our diocese will have a new bishop, and KNOM a new owner. 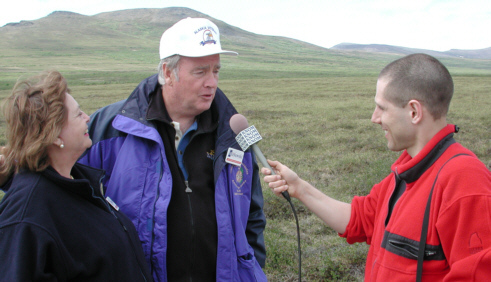 The Fairbanks cathedral is over 520 miles from Nome, but thanks to Peter Van Nort, a former KNOM volunteer and longtime commercial broadcaster in Fairbanks, KNOM will air the three-hour ordination of Msgr. Donald Kettler live to western Alaska. Next month, we hope to offer a photo or two of the ordination. In the meantime, please join us in prayer for Bishop-elect Kettler, won�t you? And please continue to keep our mission in your prayers, too. Thank you so very much for your kindness to us and the remote village families whom we serve. We just learned that KNOM is being honored by the nationwide 2002 GABRIEL �RADIO STATION OF THE YEAR� AWARD, for the 7th straight year. It�s among the most prestigious honors in broadcasting. You can imagine how excited we are! (Left) This is KNOM's 2001 Gabriel, one of nine -- soon to be ten -- in the KNOM front office. 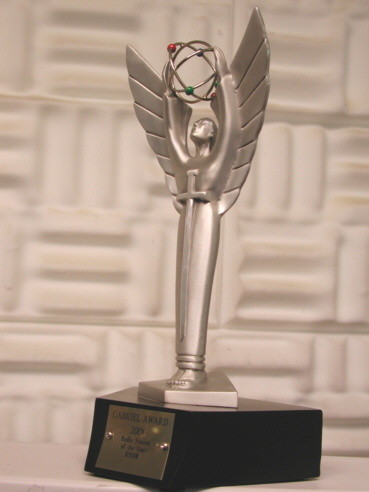 The 2002 award will be presented at the Sheraton Universal Hotel in Los Angeles, CA the evening of October 19th. If you would like to join us, please contact KNOM general manager Tom Busch no later than September 5th to reserve seats. We expect that the cost of a banquet ticket for the event, sponsored by Unda-USA, will be about $60. (Left) On a chilly summer day, U.S. SENATOR FRANK MURKOWSKI and his wife Nancy chat with KNOM news director Paul Korchin. Murkowski is the leading Republican candidate for Alaska governor. Murkowski's trip to Nome was a quick one; he was on the ground for only seven hours before heading back 4,000 miles to Washington, DC for a floor vote the next afternoon. INSPIRATIONAL SPOT: If everyone saw himself or herself as a true living member of the Body of Jesus Christ and we treated one another that way ¾ what a different world it would be, wouldn�t it? 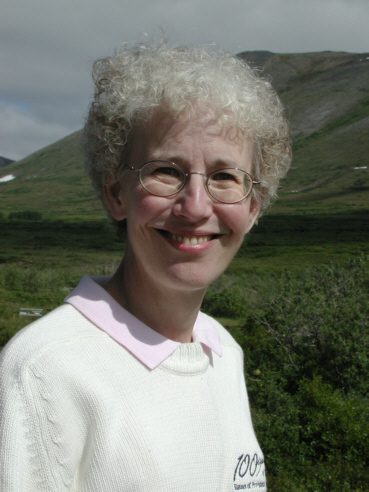 top WITH REGRET, we note the death of a long-time Alaskan missionary and friend to KNOM, Fr. René Astruc, SJ. Born in France, Fr. Rene served village Alaska from 1950 until a year before his death of cancer at the age of 78. (Above, left) Fr. Rene, in the foreground, Eskimo dances with, from left, KNOM spiritual director Fr. Mark Hoelsken, SJ and former KNOM executive director Fr. Paul Macke, SJ. Fr. Rene will long be remembered fondly by the Yup�ik people of the Yukon River Delta, who considered him one of their own. 100TH: (left) We enjoyed the visit of former Nome volunteer Sr. Paula Cosko this summer. Sister Paula and six other Sisters of Providence came to celebrate the 100th anniversary of the order�s arrival in gold rush Nome to found the frontier town�s first hospital. From 1969 through 1972, Sister Paula taught catechism at St. Joseph Parish, and lived with the KNOM volunteer community. After that, Sister Paula taught elementary school in the Seattle area for 21 years. Today, she instructs introductory English to adults in Seattle. 22,600: That�s how many inspirational spots KNOM has broadcast since January 1st, plus an equal number of educational ones. Thank you for helping make this work possible. Please consider adding missions like KNOM to your will. All bequests are prayerfully placed into savings for long-term improvements or for emergencies. INSPIRATIONAL SPOT: The future is as bright as the promises of God. We know not what the future holds, but we know Who holds the future. INSPIRATIONAL SPOT: Forgiveness -- it saves the expense of anger, the cost of hatred and the waste of spirit. top ALL SMILES: (left) Please welcome KNOM�s newest volunteer, Emily Barrett. From Clinton, IA, Emily�s a 2002 graduate of Carthage College in Kenosha, WI. Emily applied to KNOM out of a �sense of adventure.� and because she wants to blend creativity with her college training in social work. Emily enjoys theater and reading, especially biographies. TIRE-D: We�ve taken good care of our 1990 Toyota 4-Runner. While it has only 45,000 miles under its belt, those miles have been tough, the summer ones choked with dust on rocky gravel roads, the winter ones plodding through snow and grabbing onto sheer ice, in wind and often sub-zero temperatures. It needs to be replaced, at a cost of about $35,000 delivered to Nome. As you know, a reliable 4-wheel-drive vehicle here is a must, for the safety of our staff and volunteers. We purchased our 4-Runner twelve years ago for its operating economy and its excellent reliability. After research, we think that it�s still the best choice for a vehicle that we hope will serve the mission through the year 2014. Several of our benefactors have said �go for it!� and have chipped in about $4,000 based on our brief mention of this need two months ago. We can sell the present 4-Runner for up to $10,000. That leaves us $21,000 short as of late July. Can you help? 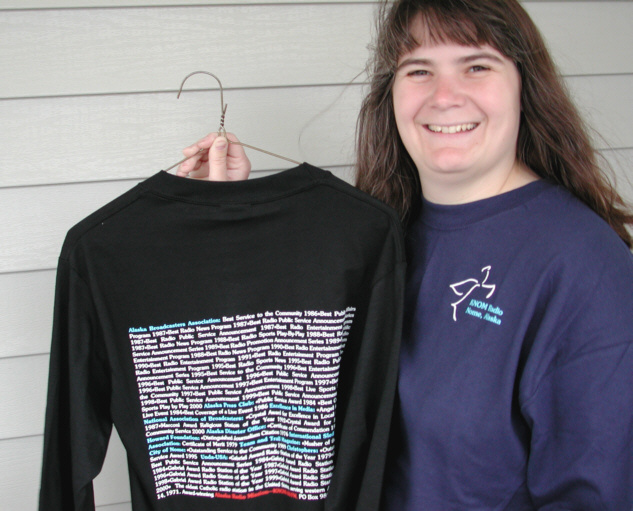 �TEE LEAVES�: We have extra T-shirts from our 30th anniversary, with a KNOM angel on the front lapel and what is now an out-dated listing of KNOM�s many awards across the back. There�s an assortment of Large and XL, in royal blue, black, purple and navy. (Left) KNOM'er Connie Albers modeled the shirt for us last summer. We will try to meet your color preference but cannot guarantee any particular color. If you�d like one of these comfy, collectable shirts, they�re available at a reduced price of $15.00 each, postpaid. INSPIRATIONAL SPOT: Help us, Lord. In the laws we pass, in the rumors we stop. In the risks we take. In the convictions we show. In the issues we face. In the sins we confess. And in the creeds by which we try to live. INSPIRATIONAL SPOT: Love doesn�t make the world go round. Love is what makes the ride worthwhile. top THIRTY YEARS AGO: In August 1972, Les Brown joined KNOM as a one-year volunteer announcer/engineer; his wife Paula taught catechism at Nome�s St. Joseph parish. 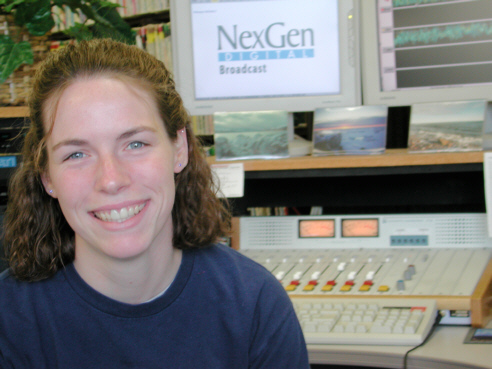 KNOM�s first year, power outages threw the station off the air 69 times. 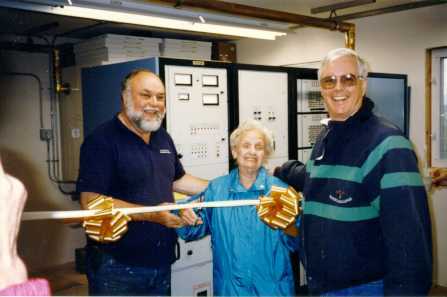 Thirty years ago this month, Les joined volunteers Fred Dyen, Jerry Springer and Chris Brockway, installing emergency generators at the studio and remote transmitter, and constructing new buildings to house them. The studio generator was a World War II engine that had been used at the Yukon River mission of Holy Cross before being retired years later. It served KNOM for 21 more years! Following his volunteer year, Les embarked on a career in broadcast equipment marketing. In 1997 he and Paula �retired� to Nome, and he serves as KNOM�s permanent engineer. FIVE YEARS AGO: We just missed the feast of the Assumption. At 2:08 AM August 16, 1997, KNOM switched over to a new 25,000 Watt Nautel transmitter in a secure new building, replacing the 10,000 Watt transmitter and its 40-year-old highway construction shack. The improvement in KNOM�s distant signal was noticed immediately. 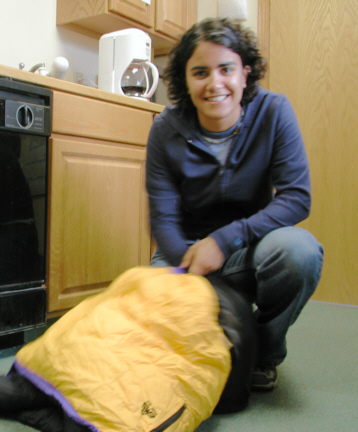 PACKING: (left) A sleeping bag and a tent were to be KNOM volunteer Julia Arrotti�s home for two weeks, as she headed to Toronto to cover World Youth Day for KNOM. She was planning to make many live reports. (Julia left Nome on the afternoon that this issue went to press.) She is one of a half-million pilgrims who were expected to attend the event, at which she was hoping to see the Holy Father. Julia�s air fare and expenses were contributed by an anonymous benefactor. Our mission is entirely dependent on your gifts for our day to day operation. We pray that you will be greatly rewarded for your generosity. Thank you! KNOM is the oldest Catholic radio station in the United States, beaming inspiration, education, information, companionship and wholesome entertainment into remote Eskimo and Indian villages throughout 100,000 miles of vast, road-less Western Alaska. And eastern Russia, too. Thank you for your contributions and prayers that keep this vital work alive. May God bless you for your help. INSPIRATIONAL SPOT: Did you know that Our Lord appreciates all the good things you do? Especially the ones that are difficult. Copyright 2002 KNOM. All rights reserved.